This weeks segment highlights the affect of climate change on plant life in East Antartica. There is evidence of climate change affecting moss beds in East Antarctica. In East Antarctica, green moss beds emerge after the snow melts for 6 weeks. West Antarctica and the Antarctic Peninsula have experienced significant climate changes, but East Antarctica was yet to experience anything major. Professor Sharon Robinson from the University of Wollongon in Australia was surprised to see abrupt changes in the moss. In 2003 the monitoring system was first set up and the moss beds were lush and bright green. When her team returned in 2008 the majority of the plants were red. The dark red color indicates the plant is stressed. The red pigment is meant to act as sunscreen. On the team’s most recent trip to East Antarctica, there were also patches of grey moss indicating the plant is starting to die. This behavior is caused by a drying climate in the region. It is now too cold and windy for the moss beds to live primarily under water. The drier climate is a result of climate change and ozone depletion. This visual from Iowa Environmental Mesonet shows extreme rainfall in Des Moines this past summer. 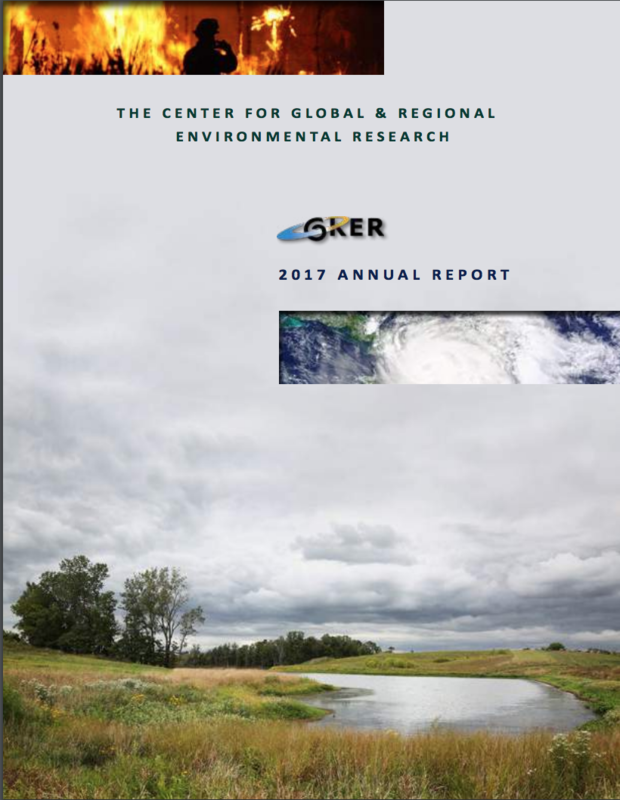 The UI Center for Global and Regional Environmental Research had a big day yesterday; we released the 2018 Iowa Climate Statement at the Cedar Rapids Public Library for the press and public. Today we can reflect on the magnitude of the statement’s message. 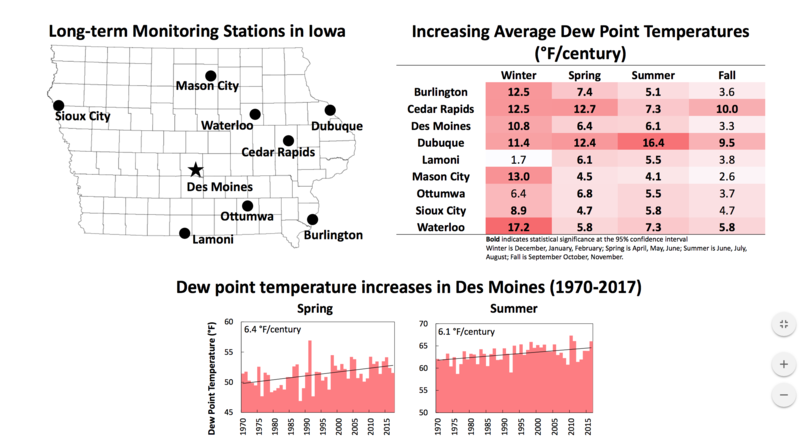 Titled “Designing Buildings and Communities for Iowa’s Future Climate,” the statement warns of the urgent need to adapt buildings and public infrastructure to withstand the extreme weather of tomorrow. Scientists predict that average annual heat waves will increase by 7ºF and the most extreme rainfall events will double in intensity by midcentury. Schnoor presented the statement yesterday with Associate Professor of Architecture Ulrike Passe, director of Iowa State University’s Center for Building Energy Research. She provided examples of several adaptations that can be made to buildings to prepare them for increased heat and precipitation, including steeper roof slopes, increased insulation and better ventilation. She said Iowan communities should consider managing increased rainwater runoff with green, vegetation-based infrastructure like rain gardens and urban forestry as well. These adjustments need to be made as soon as possible; Iowa’s weather is already feeling the effects of climate change. Burning less fossil fuel and reducing atmospheric carbon emissions can help mitigate climate change’s impacts as well, but at this stage, adaptation is absolutely crucial. We at CGRER hope those with decision-making power take the statement to heart, and listen to the record 201 science faculty and researchers from 37 Iowa colleges and universities who endorsed it.